"Flourish" Video -The Day Before Sangeet's Big Surgery! Learn Segmented Breathing: "4-to-1" Breath -To Breathe Away Stress! Just one more step: Please check your email to confirm your subscription. Please enter your email to subscribe! Written by Hari Nam Singh. 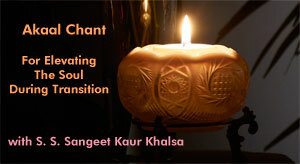 Please Note: In this audio recording Sangeet leads us in a strong and powerful meditation chant using the “Chotay Pad” mantra. This mantra is also known by its opening line, the “Sat Narayan” mantra. Chant this meditation to bring peace within and beyond by bringing up the light of clear and positive mind. Written by Sangeet Kaur Khalsa. 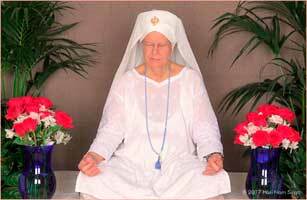 Please Note: This video of a wonderful “Valentine's Day” Kundalini yoga class includes the pranayam “Re-vitalizing The Heart Area”, the yoga set “Heart and Soul”, the meditation “Heart Shield Meditation” and of course Sangeet's “old world” charm, Yogi Bhajan and personal stories, and humor! Please Note: In this video Sangeet gives an introductory talk about “Segmented Breathing” and “4-to-1” breath followed by instructions on how to do it and concludes with a variation using the “Panj Shabd” mantra (the “Saa-Taa-Naa-Maa” mantra). 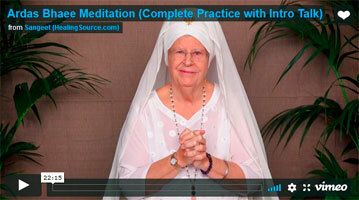 Please Note: This video begins with Sangeet "Tuning In" with the "Adi Mantra", then giving her “Insights about this Meditation” followed by the "Siri Gaitri Mantra" meditation (31 minutes) and a "Relaxing Gong Layout" (about 14 minutes) then concludes with the "Longtime Sunshine" song.